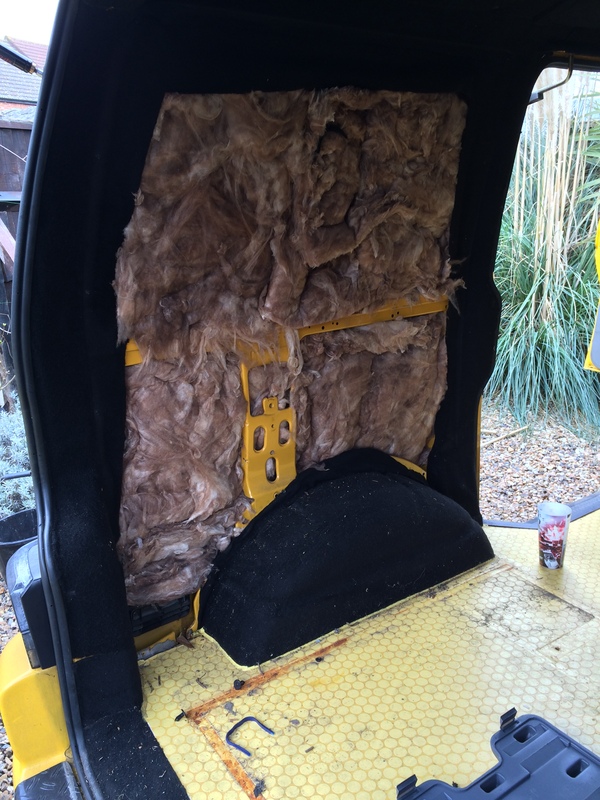 One of the first things we did when we got Bumblebee was install central locking to both passenger doors and the sliding door, when me and Andy took the panel off the sliding door to fit the central locking motor and contacts we came across the worst kind of insulation you can use for a van, bog standard loft insulation aka lagging. 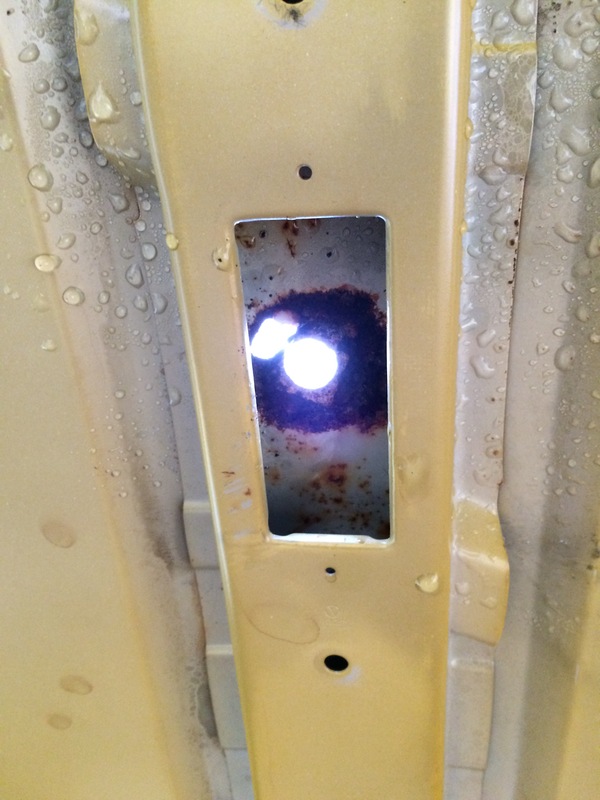 It’s bad for a number of reasons but the main one being it absorbs moisture, either from cooking or making tea in the van or just breathing, soaks it all up and rusts your van from the inside out, it had to go. 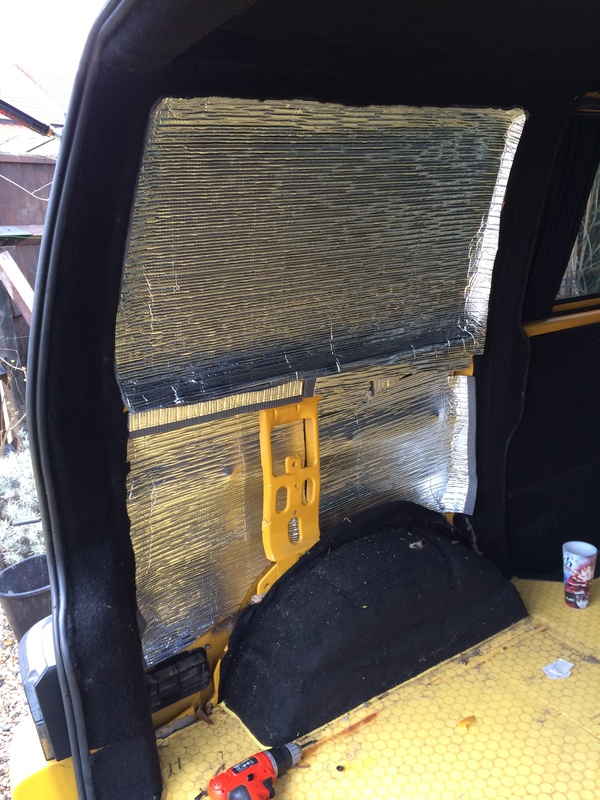 First thing to do was decide how to insulate the van, there are a number of methods to choose from, some involving bubble wrap, others using recycled plastic bottles, the cheapo option the previous owner went for or the method I chose, Thermoliner. The principal behind Thermoliner is you stick it on your van and then put your panels back creating a void between the outside of your van and the inside, the thermoliner greatly reduces the transfer of the climate outside of your van to the inside and the climate inside of your van to the outside, I bought a roll of Thermoliner 8m x 1m from Harrisons Trim Supplies, you can read all about it and order it from here, I put my order in and it arrived the next day, sweet. 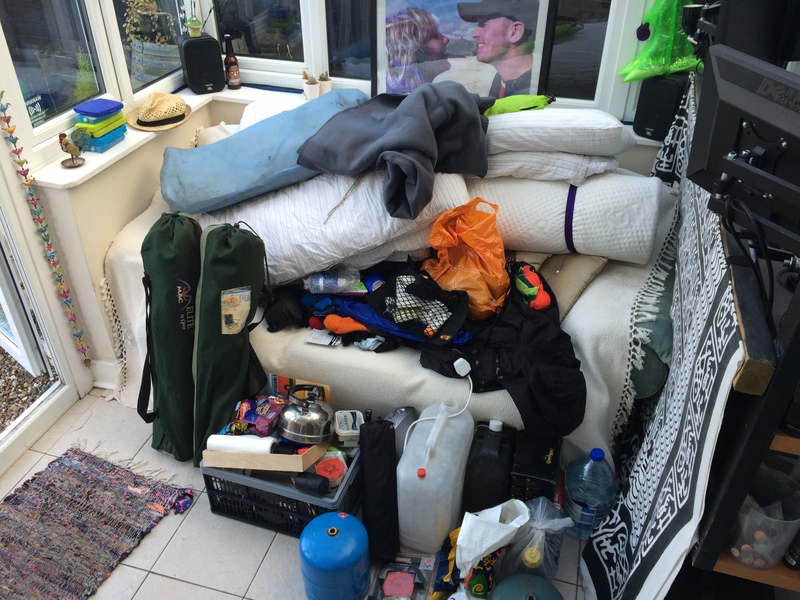 First job was to empty the van, it’s an eye opener when you take everything out of the various nooks and crannies and put it in all one pile! 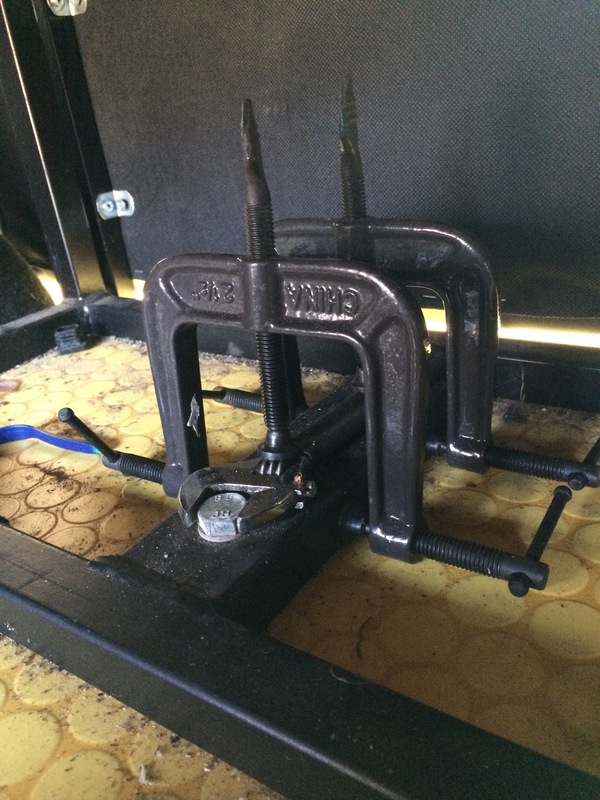 Next up was to get the bed out, this is held in by four bolts, the two nearest to the tailgate are easy to get out as I could hold the spanner on the bolt with one hand and use a socket to undo the nut with the other, there was no way I could do this for the two nearer the cabin, i’d need 8 foot super bendy arms and hands with grips like the jaw of a pit bull, luckily I had some g-clamps, I was quite impressed with my impromptu ingenuity! 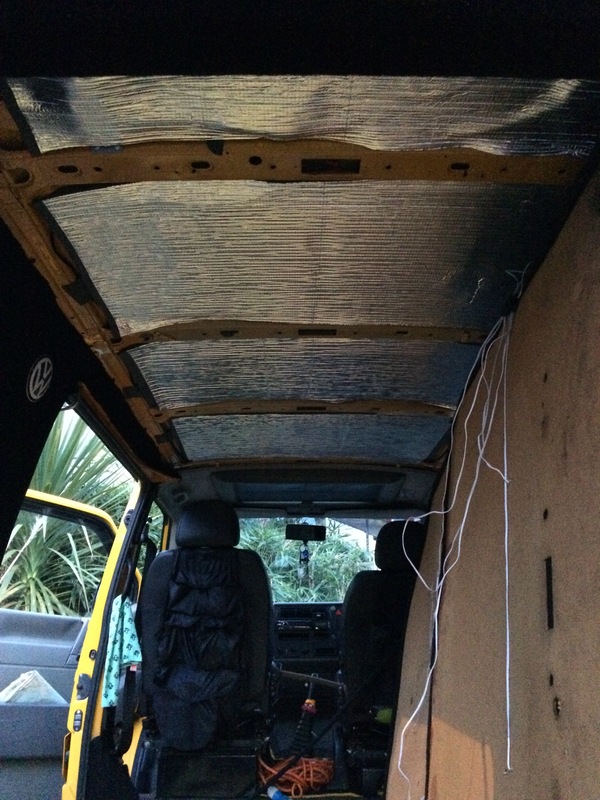 I managed to get the bed out by myself and left it on the drive and set about removing the first panel. As I suspected, full of crappy lagging, I removed that and set about replacing it with Thermoliner. I used the panel I removed as a template and marked out the amount of Thermoliner I would need. 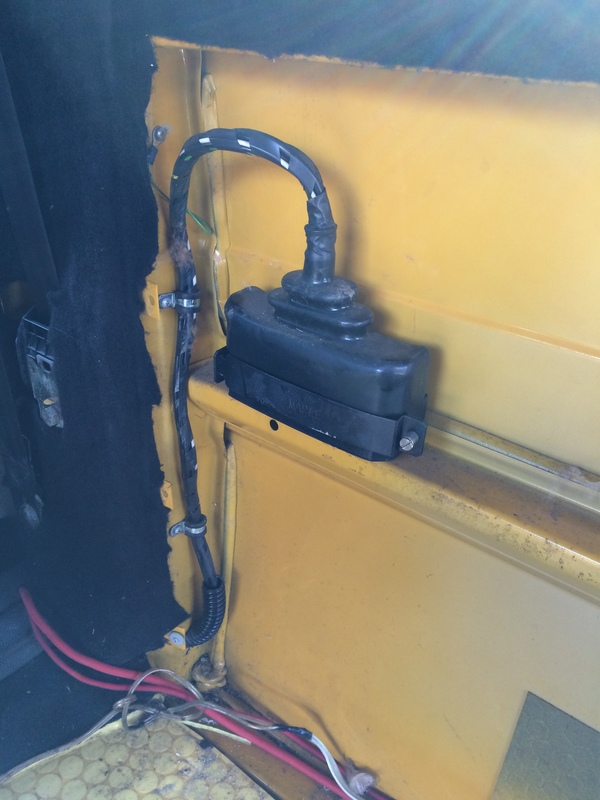 It was pretty cold and I was a bit worried the Thermoliner adhesive back wouldn’t stick, not a problem, it stuck without issue. Thermoliner is my new favourite thing, it’s really easy to work with, it’s easy to cut and sticks to anything, before I could make any further progress the cat came to inspect my work. 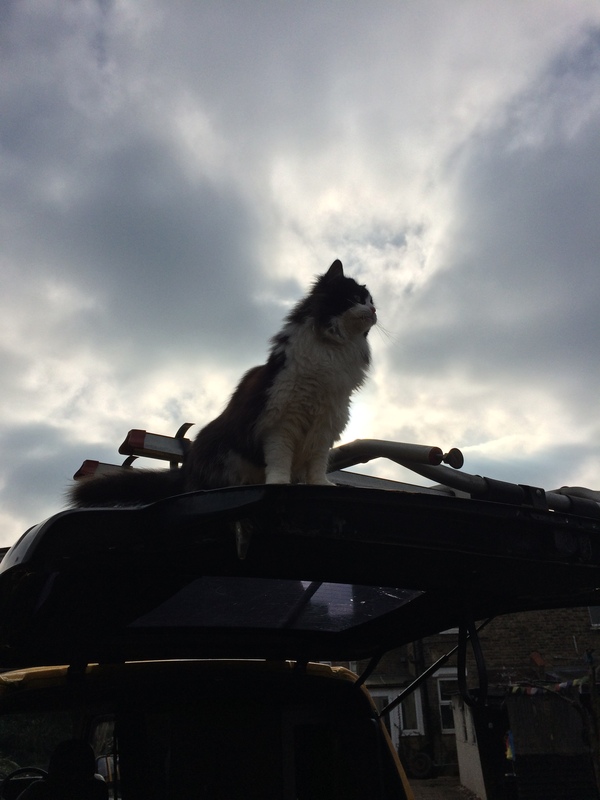 Once she was happy she tested the tailgate to see if it could take her weight, no issue there. 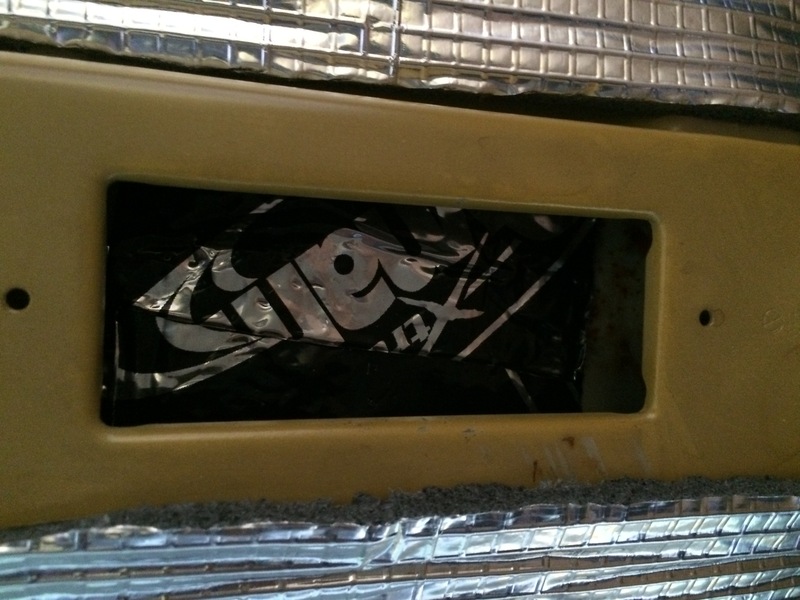 Once the cat jogged on I set about undoing all the electrics and unbolting the cabinet so I could access the panels behind it, as you can see there was a small bit of awful insulation, one whole panel was left completely exposed. 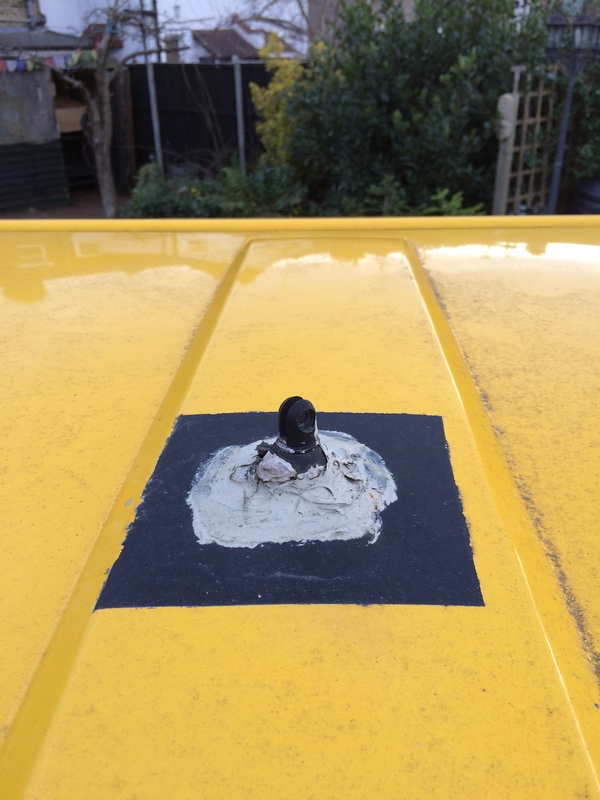 I came across this which I think is part of the vans previous life with the AA, I have no idea what it does but disaster would probably follow if I removed it so I left it where it was. 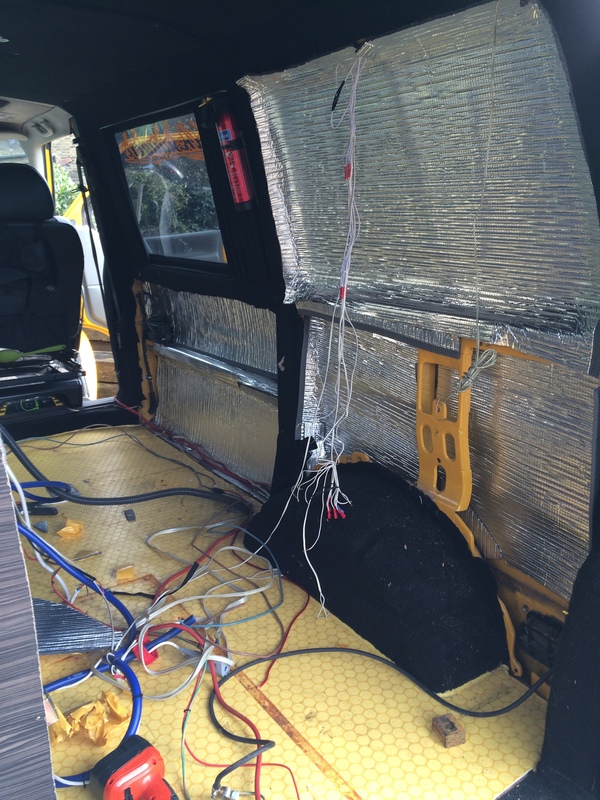 In about an hour the drivers side of the van was properly insulated. Once i’d replaced the panels on the drivers side I moved the cabinet back and secured it properly, the whole thing was held in place with 4 screws, there are also a number of internal brackets that might as well have been held together with blue tack, how none of this came apart is beyond me, I spent about an hour reinforcing all the brackets and securing the cabinet to the walls and floor of the van, it’s solid now, how it should have been in the first place! Next up and the last job for Thursday, the roof. Trim clips are my new least favorite thing, what a pain in the arse they are even with a trim clip removal tool. 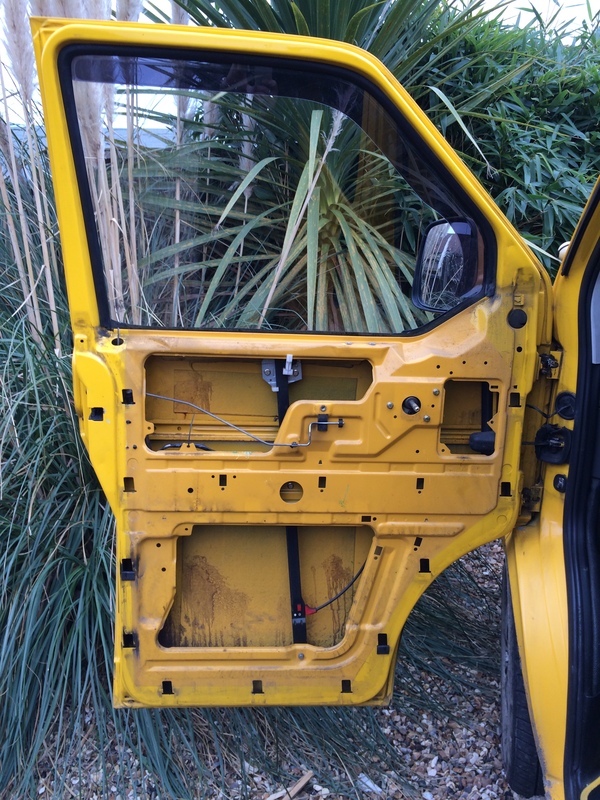 Since we’ve owned the van there has been an ugly remnant of the Bumblebees previous life as an AA van i’ve been meaning to remove. 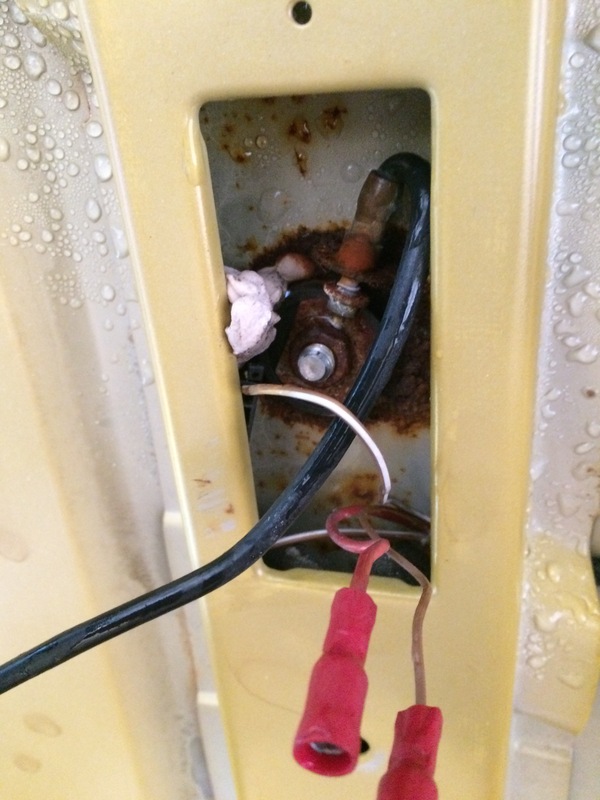 This is about where the drip came through when we were in Seaford, I cut out the cables and undid what ever that thing was leaving a nice hole in the roof! 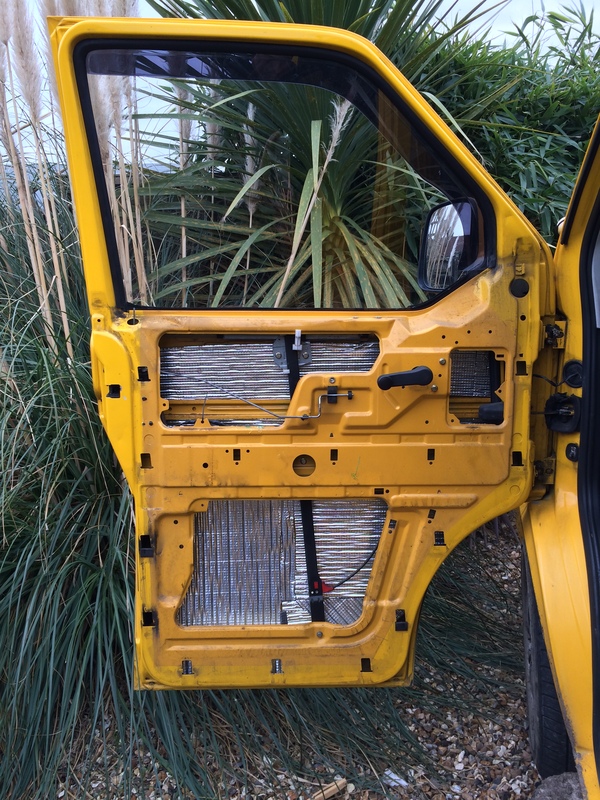 Ideally I would have cut out the rust and welded a plate in to cover the gaping hole however I can’t weld and didn’t have any plates hanging about so i did the next best thing, I wired brushed off the rust and sealed the hole internally with Dynamat and externally with all purpose clear silicon, should hold fine! 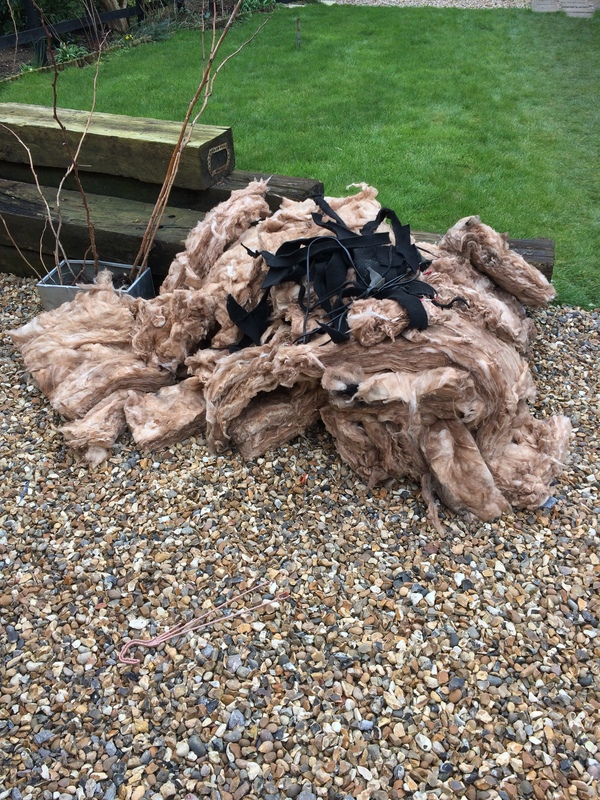 None of the roof had been insulated, it is now ! I finished up for the day and left the roof panels down overnight to dry as they were damp from the leak. 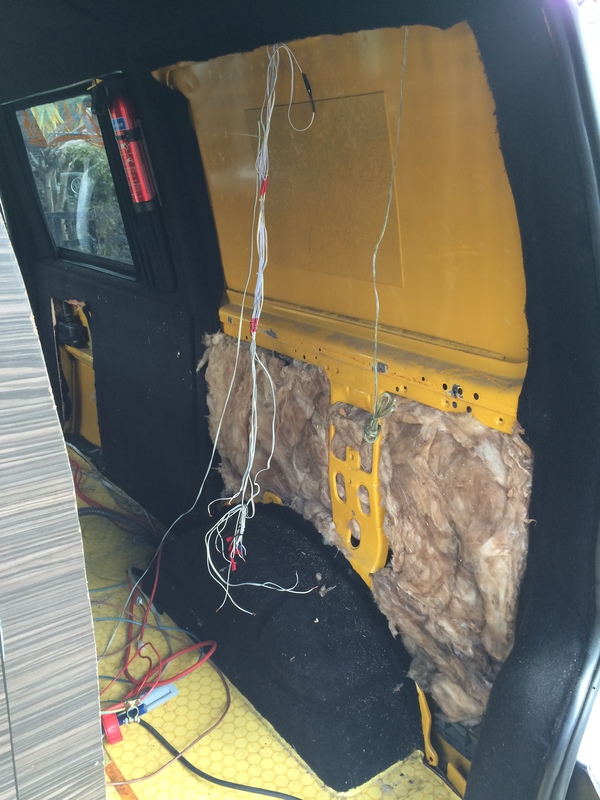 It took me a day to do that and I was nearing the finish line, all that was left to do was put the rock and roll bed back in along with all the stuff that lives in the van and decide what to do with the Thermoliner I had left. 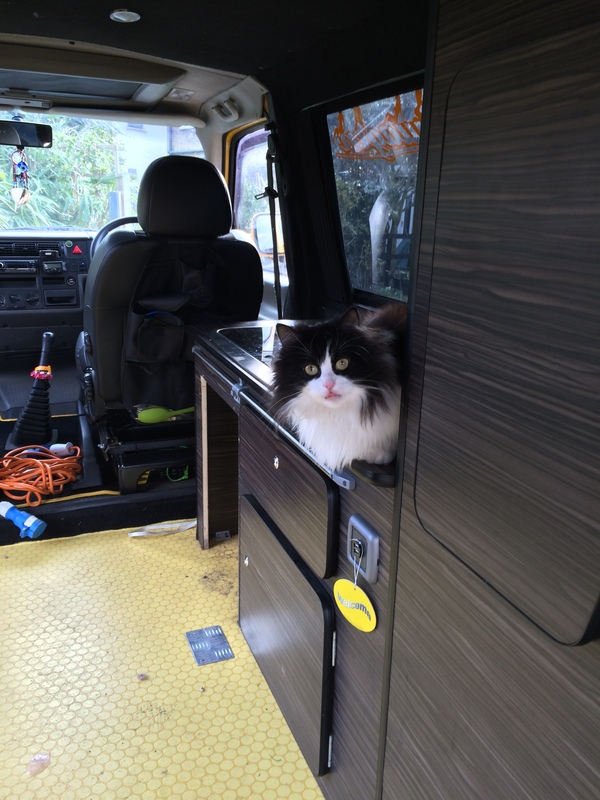 Lolly helped me get the bed back in and I ferried all out “essential” stuff back to the van. The van is now in my opinion properly insulated and should be leak free, I took a picture of all the lagging I took out of the van along with the left over AA cabling..
I’m glad I finally got round to insulting the van myself, i’ve been meaning to do it for ages and I hope it keeps us nice and warm in Wales, i also feel I can put a built not bought sticker on the van as i’ve pretty much properly redone everything the previous owner put in. If you are reading this and starting a build i’d really recommend Thermoliner for your insulation, it’s easy to work with, good value for money and delivered pronto if you order it form Harrisons.